(Raccoon Dogs - Wishful Thinking - 02) The raccoon dog, which is also known as the "tanuki" throughout much of its range, is perhaps one of the most unusual canids in the world. 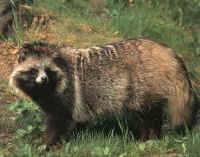 It is a dog that for all their physical appearance looks just like a raccoon, having raccoon markings and body structure. This is where the species name, procyonoides, comes from; Procyon is the scientific name for raccoon. It has a very thick body, stout legs, small rounded ears, and bushy tail. Their thick, short fur is a grizzled grey in color, with dark areas around the eyes, the legs and the tip of the tail, and lighter areas on the muzzle and underneath their tail. The canine teeth are small, so most of their chewing is done through the molars. 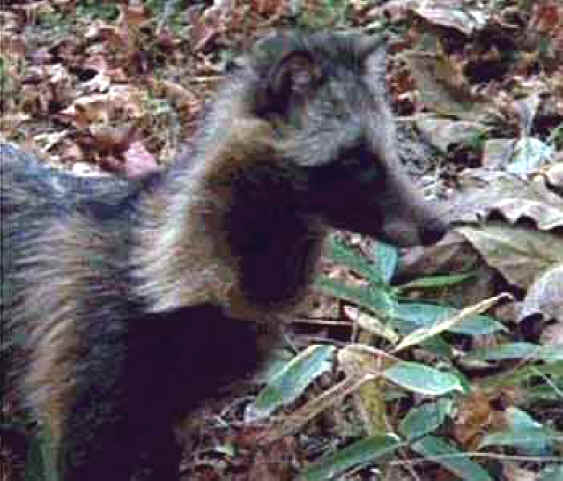 Raccoon dogs have no close living relatives in the dog family, though they show both behavioral and anatomical links to the bat-eared fox (Otocyon megalotis).